I should move to London. In the long run, it would be best if I moved to London. Madness you might think bare in mind I have a great job that I love in Bristol and have wonderful friends here and there is cider. Not the mass market stuff but proper West Country cider, the type that will make you forget your own name and start fights. So why should I move to London- well I have an awesome group of friends, who I go travelling with (who helped me eat my way around San Sebastian and other spots around the world) and generally have a fantastic time with? Seriously, we could be in a field in the middle of nowhere with nothing and still have a great time. Right, gush over. And it so happens all our birthdays are nicely spread out across the year and roughly one a month. Which entails I get to go and try the cool spots in the big smoke is where all of them live except me. This weekend in the middle of moving flats (the reason for no new cooking posts just reviews), it was one of these great friends birthdays- Bernard – not her real name….don’t ask. Like the flouncy ladies that we are, we donned our finery and went for Not Afternoon Tea, Afternoon Tea at the Oxo Tower on the South Bank. What is Not Afternoon Tea, Afternoon Tea, I hear you cry, well its fancy afternoon tea of delicious dessert plates and alcohol! There are four different theme plates to choose from all with complimentary cocktails. 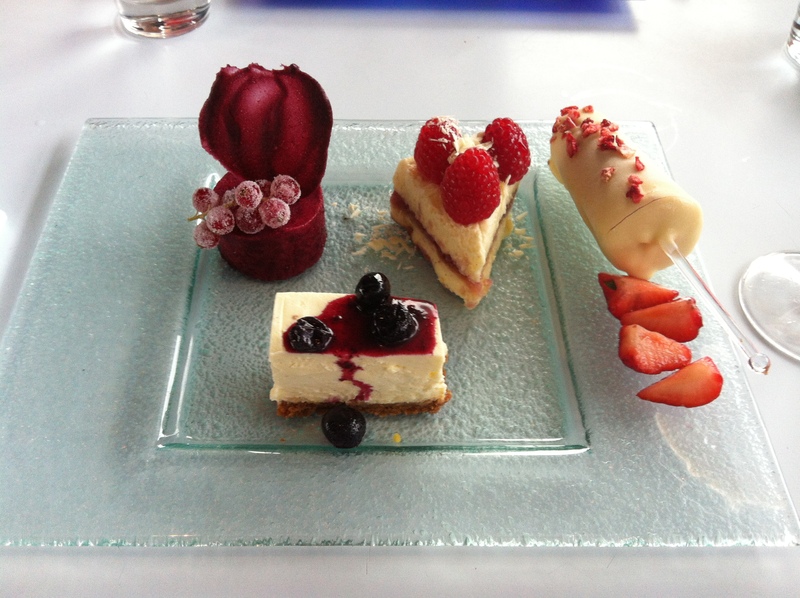 And what also compliments the desserts and the cocktails are the views, which are stunning! From the South Bank, you can see across the Thames to St. Paul’s, the Gherkin and the rest of London. – Yoghurt sorbet with black strawberry balsamic pearls – really fresh tasting sorbet, creamy texture which some yoghurt based desserts lack the body needed. The pearls had a lot of flavours but the texture of hard tapioca balls, not unpleasant but did add the difference to the smooth sorbet. – Lemon Jazz – this little sponge had a little texture with zesty lemon and studded with tiny chocolate studs, not big enough to detract from the freshness of the sponge but compliments. Also was topped with a lemon curd and white chocolate truffle. Yum. 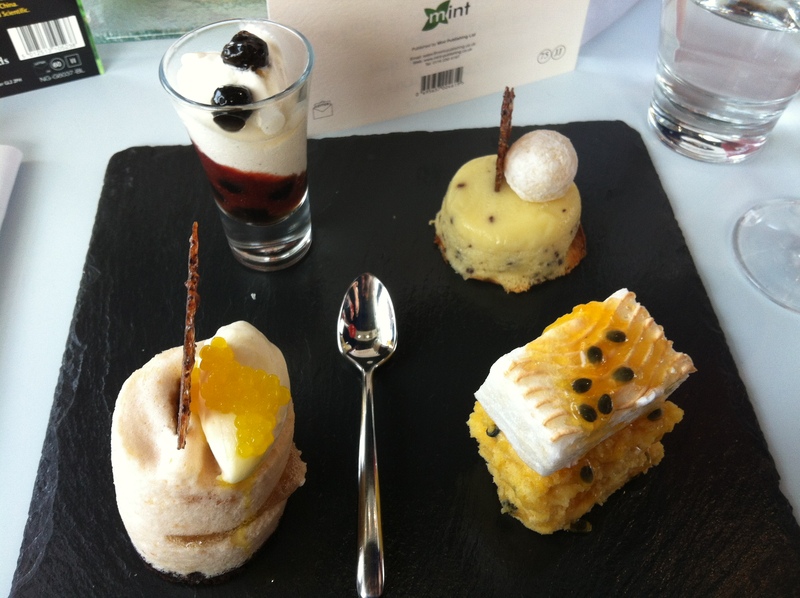 For £22.50 each, it was well worth trying some different desserts and the presentation was top notch. I think I would go back to try their full lunchtime menu and have one of their puddings as we did then go on to somewhere else for dinner as needed something to go with the many bottles of prosecco. Highly recommended though and will be going back soon. 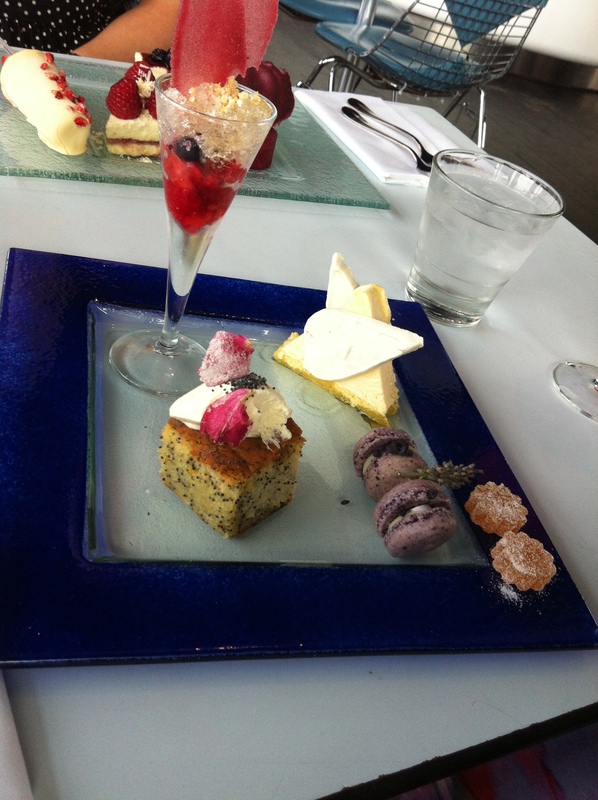 Below are the other dessert plates the other ladies picked. Those desserts look so good! I love the Oxo tower, but haven’t been for ages. That afternoon tea looks and sound amazing – more than enough reason to return! I must give a shout out to my friend May who made that delicious dessert for you working at the oxo is as much fun as dining at the oxo. Working there was hard but its worth it in the end May works her but off every day and is such a amazing pastry chef.